A 1-year warranty conveys to the original purchaser against manufacturer defects. In addition, if the original purchaser suffers buyer remorse during the 30-day period from date of purchase then there exists a “no questions” return policy. The “no questions” return policy requires the original purchaser to request a refund (less shipping & handling) within 30 days of purchase and promptly return the Key 2 Life® (EMR) product with its original packaging, by shipping it back (at buyers expense) to Safe Guard Medi-Systems corp, 21301 NE 20th Avenue Miami, Florida 33179, to be delivered promptly at its corporate office and arriving in like-new condition. Package to include note indicating buyers name address and phone number with request for Refund. An accidental damage warranty is now available at a rate of $18.00 for one year of coverage or two years of coverage at a rate of $27.00 for two years of coverage. This coverage can be renewed on the 1st or 2nd anniversary date from the date of purchase, respectively. 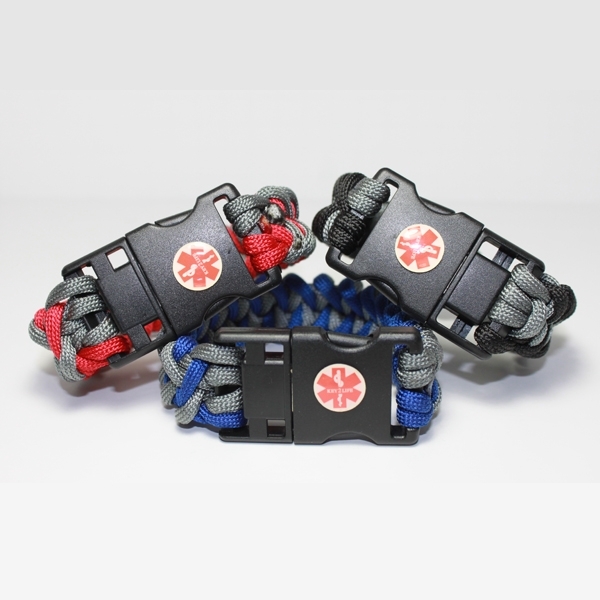 The Extended Warranty covers theft or accidental loss of the Key2Life® (EMR) as is accidental physical damage, accidental water-damage, and the wearing off of the crucial medical symbol. Accidental dropping of the Key 2 Life® (EMR) which results in breakage is also covered. This warranty offer to cover theft, accidental loss, and accidental damage does not cover intentional or reckless conduct by you or by persons acting in your stead. Warranty does not extend to matters of cosmetic scratch or cosmetic imperfection that occur as a result of reasonable use. 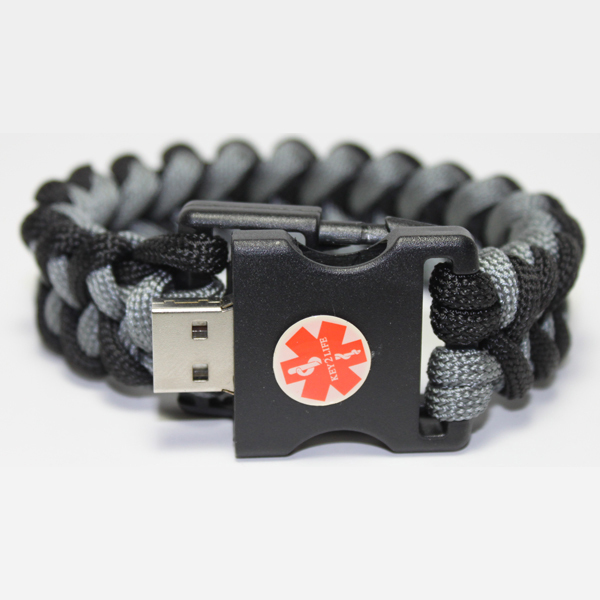 This Paracord EMR Medi-Chip Bracelet contains our Key 2 Life® (EMR) USB Medi-Chip that is 100% Waterproof. 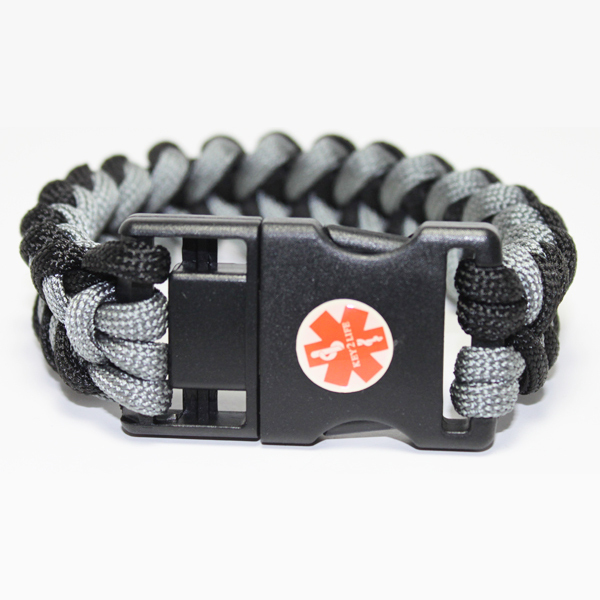 Black and Grey paracord medical id usb bracelet is 8.5 inches long.This has the medical alert star of life symbol on the front of clasp. Dimensions: 7/8" wide by 8.5" Long approx.